U.S. President Donald Trump announced Friday that a deal was reached with congressional leaders to reopen the government temporarily, ending a shutdown that was in its 35th day. After rising over 250 points to start Friday’s trading session, the Dow Jones Industrial Averaged dipped 150 points before rising again past 200 points as of 3:00 p.m. ET. 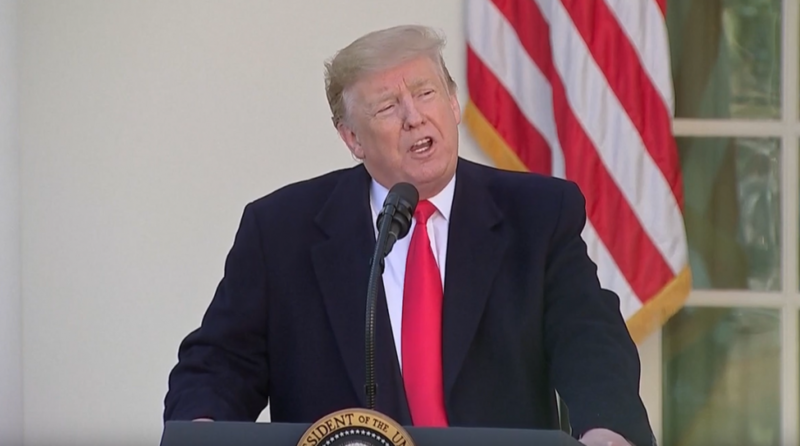 At a White House press conference, Trump said he hopes to sign the latest measure that includes restarting government operations through Feb. 15. Trump previously pledged not to sign spending legislation unless it included a $5.7 billion proposal for a border wall. As part of this latest deal, Trump said a conference committee would put together a Department of Homeland Security appropriations bill. “This is an opportunity for all parties to work together for the benefit of our whole, beautiful, wonderful nation,” Trump said while speaking the White House Rose Garden. However, Trump reiterated that the border wall remains a high priority.